It’s one thing to see a legend like Grace Jones perform in a concert hall or stadium. To have that intense experience in a private home is something else. Unforgettable, to put it mildly. The 5 February occasion was the first-ever dinner and auction in Mexico City to benefit amfAR (The Foundation for Aids Research). The house was the commodious, art-charged residence built a couple of years ago by the Museo Jumex founder and event chair Eugenio López Alfonso in tony Lomas de Chapultepec. 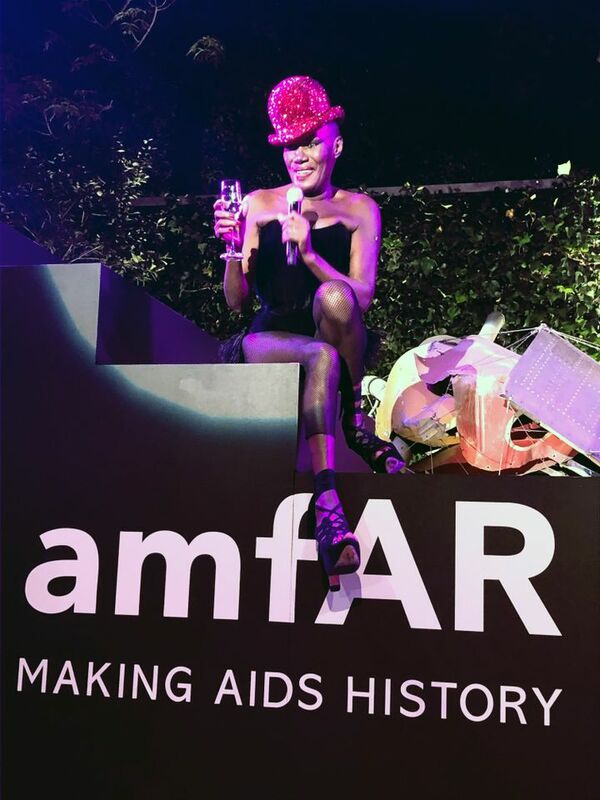 amfAR, of course, has been raising money for Aids research since 1985, when the disease was reaching pandemic proportions and the notoriously homophobic Reagan administration provided just about zero help for treatment or research in America. And it has organised enormously successful annual benefits in places like Cannes, Dallas and New York, where auctions of top-level art bring in millions of dollars at a go. After a surprisingly lethargic auction, Jones made her entrance in the first of three costume changes topped by fantastic headgear by her longtime collaborator, the Irish designer Philip Treacy, and the atmosphere turned electric. Guests rushed the stage, including López, who was as dazzled as everyone else. When Jones brought him onstage with her, mid-set, he was nearly overcome. “This is a dream come true,” he said, kneeling at her feet to loud applause. To watch the ageless, 70-year-old Jones strut and belt four of her best songs from inches away was enthralling. When she stripped down to a basic black unitard and red sequined bowler to sing Pull Up to the Bumper while twirling a hula-hoop throughout, mouths went agape. By the time she closed with a mesmerising La Vie en Rose, her audience was putty. A wild dance party followed. Jones has been associated with amfAR since Elizabeth Taylor solicited her support at the organisation’s start, and she has helping it out ever since. "I was happy to do it,” she told me a short time later, when I happened into the guest room where Jones was sitting with López, her son Paulo Goude (who had accompanied her on drums and percussion), and her lifelong friend and manager Raphael Santin. 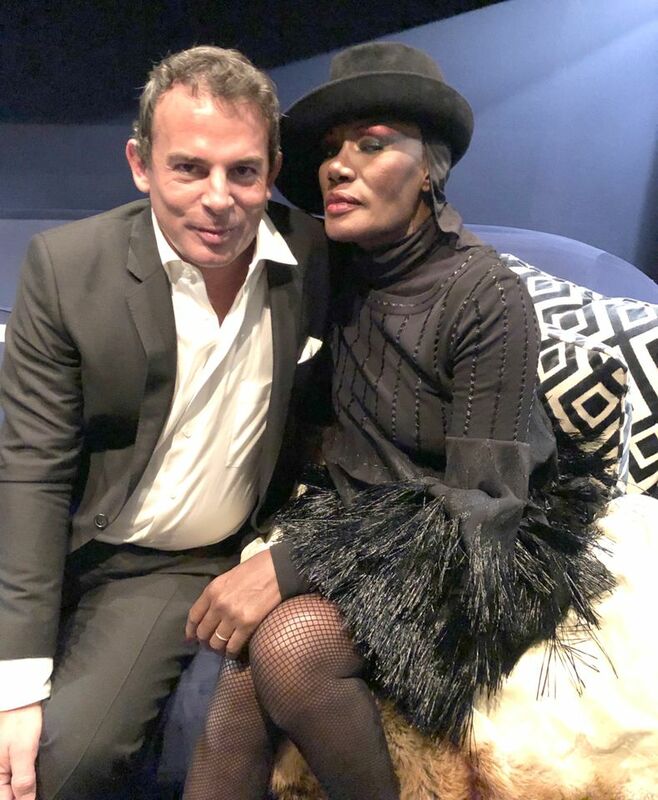 Grace Jones has a huge following in Mexico (as elsewhere), and lived here in 1982, when she shot Conan the Barbarian with Arnold Schwarzenegger. But we talked about a more recent film, Sophie Fienne’s 2017 documentary, Bloodlight and Bami, in which Jones makes a deep impression as a tireless performer, gifted songwriter, and an independent woman of enormous talent and resolve, as dedicated to her vision as she is to her family in Jamaica, where she was born (and still lives, when she’s not home in London). Finally, I couldn’t help asking Jones, now dressed in Alaia and Treacy, for a photo. As I raised my smartphone, she recalled the advice that the infamous Vogue editor Diana Vreeland gave her when Jones was starting out: “‘Don't smile’, she said, in that high voice of hers. I never forgot it.” Snuggling up to the delighted Lopez, she puckered up and gave her best non-smile. What can I say? It was an incredible—and incredibly privileged—evening of firsts. And with Jones’s help, it raised a big fat pot of cash for amfAR.